A “No Stamp Act” teapot, circa 1766-1770. 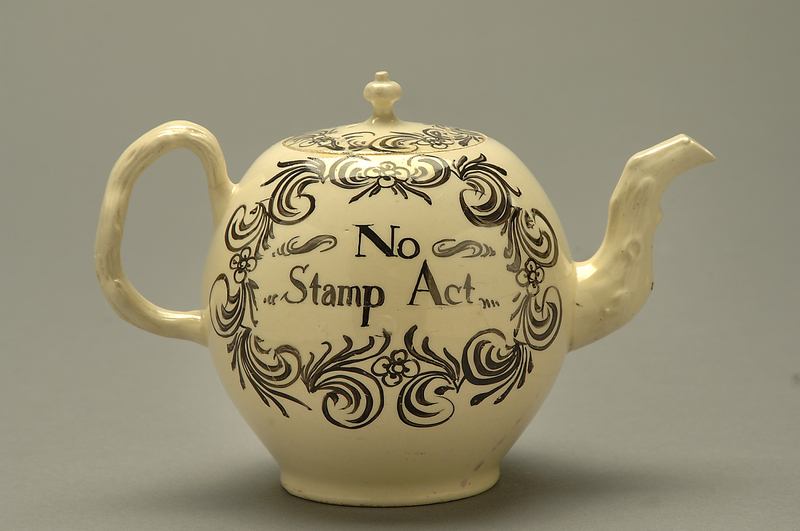 “No Stamp Act Teapot,” Digital Public Library of America, http://dp.la/item/30bea9d372364a99c97c403419b09275. Courtesy of the National Museum of American History, Kenneth E. Behring Center via the Smithsonian Institution. The Proclamation Act of 1763 (“The King’s Proclamation”), from a collection of British legislative acts. The text of the 1765 Stamp Act, from a pamphlet printed in 1895. A journal from the Congress of American Colonies in 1765, gathered in response to the Stamp Act. An illustration of a Stamp Act protest in 1765. A British text justifying taxation, 1766. An illustration of the Boston Massacre, 1770. A mid-nineteenth century illustration of the Boston Massacre by Washington Irving. A letter from Samuel Adams, Paul Revere, and others requesting a town hall meeting to consider the Tea Act, 1773. A Committee of Correspondence letter to Benjamin Franklin in London, December 21, 1775. The minutes from a meeting of the Committees of Correspondence in Massachusetts regarding British occupation, February 25, 1775. Four illustrations depicting the battle of Lexington Green, 1775. A deposition of a colonial militiaman from the battle of Lexington and Concord, April 25, 1775. A sermon preached on the anniversary of the battle of Lexington, April 19, 1776.